Learn to code, design, and develop websites as you advance your education and establish a solid career. 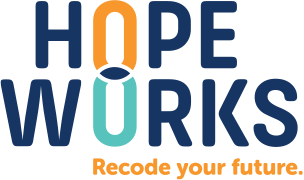 Hopeworks has helped hundreds of young people, between 16-25, like you emerge from the cycle of poverty and violence to become powerful leaders and entrepreneurs within their communities. We will work with you to get there. Work with us today. You will build skills, gain professional experience, and have support along the way. Get real-world tech skills with our three-month paid training program. You will have daily tech training as well as the support of an academic success coach and life readiness coach. Once you finish the training, we have several internship opportunities that you can apply for. Training runs Monday through Friday from 9:00 a.m. to 4:00 p.m. Contact us to get started today! Changing the course of your future also requires you to strengthen your fundamental reading, writing, and math skills. Our Academic Success Coaches customize a learning path to fit your needs, your goals, and your pace. For those without a high school diploma, we can set you up on the path toward earning high school credentials. We also offer scholarships for youth. Succeeding in today’s workplace means being ready. Ready to compete in a tech-saturated job market. Ready to handle the stresses of the workplace environment. Ready to stay healthy while managing these pressures. Hopeworks’ Life Readiness staff prepares you to succeed from every angle. You’ll have access to one-on-one counseling on a weekly basis so you have individual help as you identify what you need to make positive changes. To secure an internship with Hopeworks or with one of our many regional partners, you’ll need to be ready for the interview. We practice by giving you mock interview experience so that you know first-hand how to succeed. Opportunity runs deep at Hopeworks. One of the most unique experiences we offer is our CRIB program. Our CRIB is a residential community where successful Hopeworks alumni who are making progress in the workforce and current Hopeworks interns who are just getting started can live together and share their experiences as they both pursue college and career success. At the heart of the CRIB is community living, built-in accountability, encouragement, and safe, secure housing. It provides a common place to celebrate accomplishments, share meals, study together, laugh together, and support each other’s dreams. This is a place where you can feel at home with friends as you work toward your future together. If this sounds like the way forward for you, let’s talk. Contact us today.